The Douglas C-54 Skkymaster served around the globe during World War II and accelerated the growth of peacetime air travel. 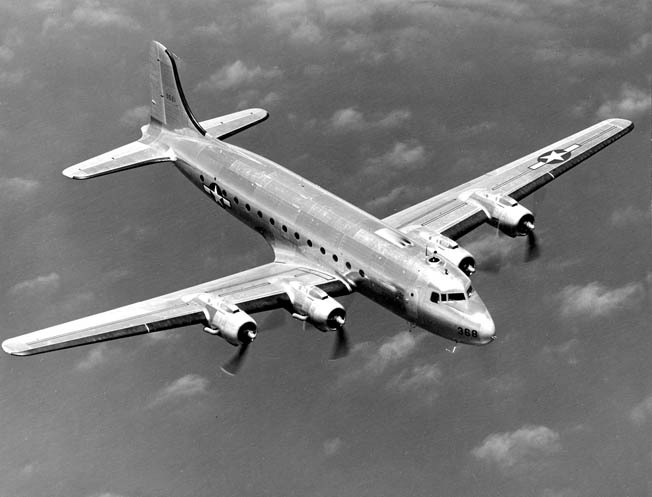 At the beginning of World War II, the globe seemed huge—covered by thousands of miles of ocean and uninhabited land mass, but by the time it ended everything had been brought closer together, thanks largely to the four-engine transports of the United States Army Air Transport Command, particularly the Douglas C-54 Skymaster. By mid-1945 the C-54 had come to symbolize the modern international airline system, a system that linked the entire world and reduced travel times from weeks and months to days and even hours. The C-54 was the result of a prewar civilian design that the Douglas Aircraft Company developed as a successor to its highly successful DC-3. The original design, later designated as the DC-4E, featured a pressurized cabin to allow high-altitude operations in relative comfort, but the design was too expensive for the cash-strapped airline industry of the Depression years and was put on hold. Instead, the company decided to develop and market the basic DC-4, an unpressurized all-metal four-engine monoplane with transoceanic capabilities and a design that would be far less expensive than the pressurized model the company had originally envisioned to compete with Boeing’s Stratoliner. It was not until 1942 that the new airliner was ready for its first flight, and by that time the country was at war. All the DC-4 production that had been ordered by the airlines was appropriated for military use, and it was not until the end of the war that the four-engine transport finally put on airline paint. In the interim, the C-54 had become the workhorse of the U.S. Army Air Transport Command and was perhaps the most important airplane to come out of the war. It was also one of the most costly, second only to the Boeing B-29 Superfortress bomber in cost per model. Initial purchase costs were more than half a million dollars in 1940, and even though production costs dropped the cost per airplane was still more than a quarter of a million dollars in 1945. Although little thought had been given to military air transportation in the 1920s and 1930s, by 1940 the War Department was starting to recognize the need for long-range transports, primarily to provide transportation for government officials and important dispatches to the far-flung regions of the world. A new need that developed just before the war was to return Army ferry pilots to the United States from overseas delivery points. The newly established need for long-range transports became so great that when the Army received its first Consolidated B-24 Liberators 11 were converted into transports even though the type had been developed to fill a requirement for a long-range bomber to replace the Boeing B-17. The converted Liberators were assigned to the recently established Air Corps Ferrying Command to establish a route system over which multiengine aircraft could be delivered to the combat zones. They were also adopted as a means of delivering dispatches and transporting high-level personnel to and from England. On July 1, 1941, Lt. Col. Caleb Haynes took off from Bolling Field outside Washington, D.C., on the first run of the “Arnold Line,” a transoceanic military airline service. Routes were soon established to other destinations; in one case an Army Liberator flew the new ambassador to the Soviet Union, Averell Harriman, to his assignment in Moscow. The need for four-engine transports was so great that the War Department ordered large numbers of B-24s converted to the transport role as the C-87 Liberator Express. The Ferrying Command also had its eye on Douglas Aircraft Company’s new DC-4, which the military designated as the C-54, although the command hedged its bets by also ordering the twin-engine Curtiss C-46 Commando. On March 26, 1942, the first C-54 made its maiden flight. Since it was a basic transport and needed no modification for military use, deliveries to the Army Air Forces began in June. The original DC-4 had been conceived as a passenger-carrying airplane; production aircraft came from the factory with fixed seats and a floor that lacked the reinforcement necessary to transport heavy cargo. Thus, they were initially assigned primarily to transport high-priority passengers and dispatches. The first Army C-54s were operated by civilian contract crews employed by Pan American World Airways on a scheduled run south out of Miami to Natal, Brazil. The route was soon expanded to North Africa, and by October C-54s were flying to England by way of Marrakech. Since the early C-54s were configured primarily to carry passengers, the Army requested a new model equipped with foldable metal bucket seats that would allow quick conversion from passengers to cargo, which was starting to become a major military air transport commodity as U.S. forces deployed throughout much of the world. Designated as the C-54A, the new version did not become available for military testing until February 1943. The first operational airplanes entered service a month later. A second modification, the C-54B, was equipped with canvas seats instead of the metal buckets of the earlier version in a weight-saving move; the easily stowable seats also allowed transportation of large crates and other items of cargo, including aircraft engines and small vehicles. The B model also featured additional fuel capacity to increase range and entered service in the spring of 1944. A four-engine C-54E is shown in flight in 1946. By 1943, large numbers of C-54s had reached the military and were being assigned to Air Transport Command. Between April and June 1942 the military air transportation system underwent a major overhaul as existing air transportation units were turned into troop-carrying organizations and a new Air Transport Command was established, using the headquarters for the prewar Air Corps Ferrying Command. The mission of the new ATC included ferrying of aircraft to combat units overseas as well as all air transportation not within the domain of troop carrier units. By 1943 substantial numbers of C-54s were starting to come into the ATC inventory, and the new four-engine transports soon became favored by the pilots and crew members who flew them. The Douglas transports were very reliable—only three would be lost at sea during the entire war, and one of those was an intentional ditching. They were also a pleasure to fly and, unlike the C-87s and C-46s, very popular with their crews. While the Liberator had a reputation for causing a pilot to really work when flying it, the Skymaster was surprisingly light on the controls and, even though it was equipped with a reliable autopilot, pilots enjoyed taking the controls on long flights. The C-54 also featured a steerable nosewheel, a feature that allowed pilots far more control of their airplanes while taxiing and in the early stages of the takeoff roll before the rudder became effective. Takeoffs in a C-54 were a lot safer than in a C-87 due to the increased directional control. The C-54 developed a reputation for being able to handle a sizable load of ice, and World War II lore among ATC flyers is that it was superior in this regard to the B-17 and B-24. The C-54 quickly became a favorite of the crews who flew it, and many believed it was superior to the C-87. The best feature of the C-54, and it was also true of the Liberator and other airplanes, was that by exercising fuel management techniques pilots could increase the airplane’s range substantially. During the first years of ATC operations, there were no standardized procedures and each pilot operated by his own set of rules. Experience soon showed that pilots who operated using varying power settings were able to fly much farther than those who simply shoved the power to the firewall and left it there. The C-54 had one drawback—and it was a major one. Although the airplane was easy to fly and reliable, its high-altitude performance was limited. The maximum allowable ceiling was only 22,000 feet, 78 percent of the Liberator’s. Since the C-54 was not pressurized and loads often included passengers, pilots operated at much lower altitudes, and the normal cruising altitudes of 10,000 to 15,000 feet presented little problem on flights over the oceans and deserts of the world. Mountains, however, were another issue. By 1943 the towering Himalayas were a frequent sight for ATC crews on their way to and from airfields in eastern India. In December 1942 ATC assumed the role of ferrying supplies from airfields in India to China, a mission that required operations at high altitudes over the eastern reaches of the Himalayas in order to avoid interception by Japanese fighters. The high altitudes required for the Hump fliers precluded the assignment of the C-54 to operations into China at the time. The new Skymaster had another drawback. Since it had been designed for airline use where it would receive regular maintenance, the C-54 suffered greatly from mechanical problems when it was operated under austere conditions such as those existing on the India-China ferry. Initial C-54 operations were in support of the war in Europe, as the first airplanes went to work ferrying personnel and dispatches from Miami to Natal. It was not until mid-1943 that the C-54s made their appearance over the Pacific. The first C-54 to operate over the Pacific was an airplane that had been drawn off of the Atlantic route for a special airlift of B-24 stabilizers to Australia in response to an urgent requirement. A second C-54 was assigned to the Pacific Wing a few days later and, as more Skymasters were delivered, the numbers on Pacific routes increased. In early 1944 the Allies commenced an operation that would change the fortunes of war in the China-Burma-India Theater and that would greatly improve the efficiency of the airlift to China and allow the introduction of the C-54 to the China ferry. A small U.S. Army provisional force under the command of Brig. Gen. Frank Merrill began an unannounced and initially unheralded walk into northern Burma. While the British force would soon be withdrawn the same way they had come in—by air—Merrill’s men were ordered to continue eastward to capture the Japanese-held airfield at Myitkyina. They managed to walk through several hundred miles of jungle and rough terrain and then captured the airfield in August, after almost six months in the field. Throughout their Burma operations, Merrill’s men were supplied entirely by air by transports assigned to Tenth Air Force Troop Carrier Command. The capture of Myitkyina was undoubtedly the most fortuitous event of the war in the CBI Theater for the Allies. Although Chinese troops who were airlifted in to capture the town became bogged down and the operation turned into a siege, the airfield was now in Allied hands and available for use by ATC transports as a delivery point from which supplies could be transported by truck and river into the Chinese interior. Even more important, the capture of the airfield deprived the Japanese of an advance fighter base from which they could threaten the Hump routes and also could serve as a base for American fighters. In short, the capture of Myitkyina led to the attaining of air superiority over Burma—and opened the door for the introduction of the C-54 to the Hump airlift. 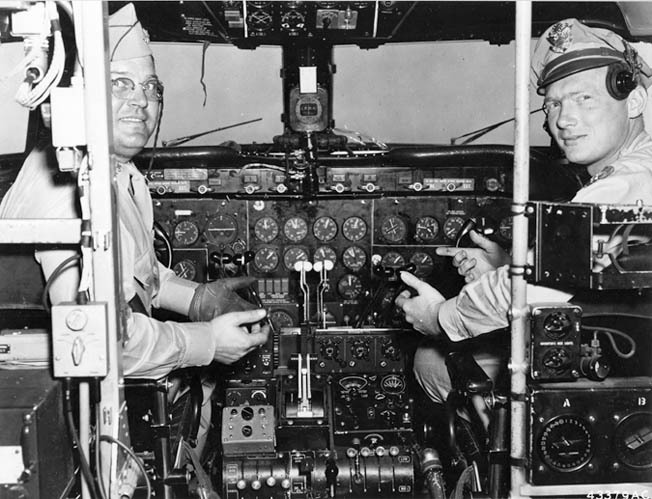 Two U.S. aviators sit in the cockpit of a C-54 Skymaster, which completed a remarkable demonstration at Wilmington, Delaware. The plane took off, flew, and landed entirely under the remote control of a pilot on the ground. Previously, ATC transports had been forced to go northward out of their bases in India’s Assam Valley before turning eastward for their off-load points in China to avoid the threat of Japanese interception. Since some of the mountains overlooking the Assam reached well above 20,000 feet, C-54 operations had been ruled out. The capture of Myitkyina allowed more direct routes into China, routes that could be transited at much lower altitudes. Now the C-54 could be introduced, helping increase the amount of tonnage over the Hump since the latest versions of the Skymaster were capable of transporting as much as seven tons on the comparatively short legs required for the airlift (the distance from the C-54 bases in India’s Assam Valley to Kunming was only 500 miles). Shortly after the capture of Myitkyina, Brig. Gen. William H. Tunner arrived in India to take command of the India-China Wing of the ATC. Tunner had developed a fondness for the new Skymaster, and before he left the United States for India he proposed that C-54s be sent to India to replace the less reliable C-87s and C-46s. His rationale was that the C-54 was a safer airplane and its use would drastically reduce the accident rate on the Hump airlift. Tunner’s initial goal was for a force of 272 Skymasters on the airlift, but the war ended before it was met. Most of the India-China Wing’s C-46s were replaced, but the larger C-87s and their sister C-109 tankers continued in service through the end of the war. A few months after his arrival in India, Tunner received a sudden windfall. General Henry “Hap” Arnold, chief of the Army Air Forces, decided that the cost of airlifting fuel and other supplies for B-29s from India to China was prohibitive and ordered the bomber force transferred to the Marianas, which had recently fallen into Allied hands. Since the new bases in the Marianas were on islands, the massive numbers of transport forces that had deployed to India with them were not needed, so Arnold transferred them to Tunner’s command. Tunner immediately began making plans to replace the C-87s and C-109s with C-54s, but his plan was never fulfilled. Even though the C-54 had not become the prime transport in the airlift to China, it had become a familiar around the rest of the world. The Douglas transport had also captured the attention of high-ranking officers in the War and Navy Departments, and several C-54s were assigned to provide transport for VIPs. General Douglas MacArthur, who had been given overall command of the Pacific War, replaced the B-17 that served as his personal transport with an ATC C-54. He named it “Bataan,” in recognition of the men who had fallen into Japanese hands after he was ordered out of the Philippines to Australia in the spring of 1942. Perhaps the most famous Skymaster was a specially built C-54C that was ordered as a presidential support aircraft for President Franklin D. Roosevelt. The presidential airplane was unique in that it included a number of features not present on other models. An elevator was added to accommodate the crippled president’s wheelchair. Roosevelt used the airplane only one time, flying to the Soviet Union in February 1945 for the Yalta Conference. The ailing president died less than two months later, and the airplane passed to his successor, Harry Truman, who used the airplane, which had been dubbed “The Sacred Cow” by the media, for 27 months before it was replaced by a militarized DC-6. Unlike the C-47, C-46, and the transport versions of the C-87, the Skymaster was never used in the troop carrier or direct combat support role during the war. This was largely due to its assignment to the Air Transport Command, which carried only behind-the-lines logistical and passenger-carrying flights. C-54s were also limited in forward field operations. Their wheel loading was such that the weight of the airplanes tore up the pierced steel planking runways that were laid down by engineers at forward locations. In fact, during the first weeks of the Korean War, C-54 operations into the Pusan Peninsula had to be suspended because of extensive damage to the runways. A Douglas C-54M flies between Hawaii and Japan to deliver priority cargo. The plane was refitted as a litter-equipped hospital aircraft and transported wounded soldiers from the battlefields of Korea in 1951. Air evacuation of casualties became a C-54 mission, particularly in the Pacific where five Skymasters configured for patient transport were placed into operation in mid-1944. Troop carrier C-47s had begun transporting patients in New Guinea in 1942, but the advent of the C-54 allowed movement of wounded soldiers, sailors, and airmen from overseas combat zones to hospitals in the United States. As the war began winding down, the C-54s that had originally been contracted by the airlines were released from the military and placed in commercial service. By 1945, there was an abundance of military pilots, and the military’s aircraft needs were being met with new deliveries, which allowed the airlines to return to their commercial role. The DC-4 had proven itself in military service, and the type was seen as the vehicle to open up international routes to Europe and South America and across the Pacific to Hawaii and Australia. The airplane had only one competitor at the time. Howard Hughes had designed a pressurized four-engine transport called the Constellation, but the military version had seen only limited use before the war ended. When the war in the Pacific ended, the 54th Troop Carrier Wing, the premier air transportation unit in the Far East, was assigned to supervise the airlift of the occupation troops to Japan. On August 28, 1945, the first flights took place as 30 troop carrier C-47s and 15 C-54s flew into Atsugi Air Base near Tokyo carrying aviation gasoline, oil, and a contingent of Far East Air Forces (FEAF) communication personnel. Two days later the combined force of FEAF troop carriers and ATC C-54s began landing the 11th Airborne Division, along with General Douglas MacArthur and his headquarters, as the victorious Allies occupied Japan. The war was over, but a new era in air transportation was beginning as the world took notice of the air transportation capabilities offered by the Douglas Skymaster. Tags Air Transport Command (ATC), Allies, Axis, Boeing B-17 Flying Fortress, Boeing B-29 Superfortress, Burma, C-54, CBI, China, Consolidated B-24 Liberator, European Theater, Frank Dow Merrill, Franklin D. Roosevelt, General Douglas MacArthur, Harry S. Truman, Himalayas, Howard Hughes, Japan, Japanese, Korean War, Marianas, Myitkyina, Pacific Theater, the Hump, U.S. Army Air Corps, William H. Tunner.